Dr. Martens was founded in 1947, and the boots have been a teenage essential for decades. However, recently interest in these boots has spiked once again, as Gigi Hadid has been wearing hers 24/7 and buzzed-about brand Vetements has launched a collaboration with the footwear giant. But what is the best way to wear Dr. Martens in 2017? We rounded up five of our favourite recent outfits showing how to style the clompy boots so they look better than ever. While we will always love how Agyness Deyn styled hers circa 2006, it's now about wearing them with cropped jeans, puffer jackets and vinyl rather than tutu skirts and short shorts. They look best when paired with cropped black cigarette trousers or a pair of ankle-grazing jeans with a statement kick-flare, such as the Zara jeans above. We love how singer Laura Hayden wore her patent 8-eyelet boots on stage with a Rockins skinny scarf and high-shine H&M vinyl trousers. Elsewhere, Elle UK Accessories Editor Donna Wallace used her white pair with a denim pinafore dress and sporty ankle socks. Scroll through the gallery below to see five of our favourite ways to wear Dr. Martens boots. Style Notes: For a rock 'n' roll look, pair patent Dr. Martens with high-shine vinyl trousers and a skinny Rockins scarf like Hayden did. Style Notes: Gigi is a big fan of Dr. Martens, but this is our favourite of her DM looks to date. She paired her cherry-red boots with a pair of cropped black trousers to show off the entire boot, and then wore an oversize Vetements bomber in the same red as her Docs. Style Notes: This Dakota Johnson look is a classic Doc Martens outfit, as she paired her black 8-eyelet boots with rolled up Mom Jeans, a black blazer and a tartan shirt tied around her waist. The unofficial model-off-duty uniform since the early '00s. Style Notes: Dr. Martens are, of course, highly practical all-weather shoes, as shown by fashion blogger Tine Andrea, who paired her suede DMs with an oversize coat. She also opted for cropped trousers to show off her boots. 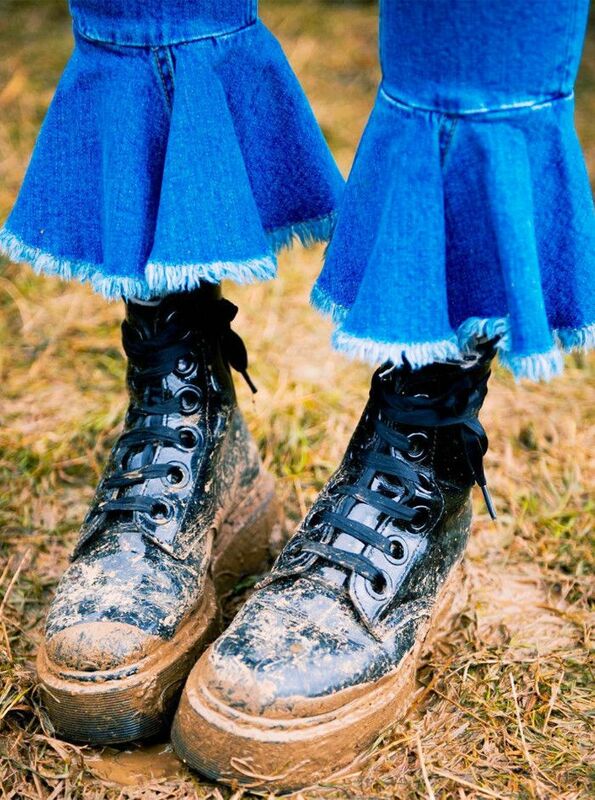 Style Notes: Elle UK's Donna Wallace wore her white Dr. Martens with black laces paired with a denim tunic during London Fashion Week. If wearing your Docs with a skirt, follow Wallace's lead, and add sporty striped socks underneath. For more Dr. Martens outfit inspiration, see all the many ways Gigi Hadid wears hers.